Click the Embed tab. From there, you may copy the resulting iFrame code. Paste the iFrame code into the text editor of the page on Aurora. Maps can be a great way to display a location on your site. They allow users to zoom in and out and view the surrounding area without having to leave the page! 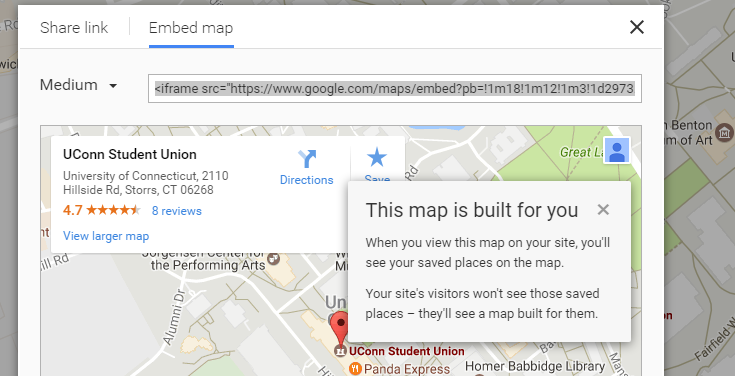 Aurora supports the embedding of Google Maps. Below are instructions on how to do so. Aurora has limited support for the use of iframes. For security reasons, ITS must be cautious in what domains to trust not to infect the large number of websites that use Aurora. Aurora permits the use of iframes from sources such as Google.com domains, Facebook, Youtube, Prezi, and more. If you would like to request a new iframe URL please submit it for approval using the contact information found on our Support page. IFrames must be entered in the text editor, not the visual editor. Pasting an iFrame into the visual editor will do nothing but display a lot of raw HTML code on your webpage.